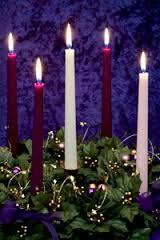 On this day we light the four previous candles and then the white Christ candle in the middle. Finally the Lord has come. He “became flesh and made his dwelling among us. We have seen his glory, the glory of the One and Only, who came from the Father, full of grace and truth.” The one we have been long waiting for has come, our Emmanuel (God with us) is here. Today in the excitement of the baby who once came to live with us also remember that Jesus is coming back. We are in the advent of His second coming and this time He is coming for us, His saved ones, and taking us home to forever live with the Father in His glorious presence. All that is wrong with the earth will be finally replaced with a new heaven and earth that is sin free. What a glorious day that will be! Until that time Emmanuel not only has lived among us, but, for those who have bowed their knee and allowed Him to save them, He is living within us and we have peace with God. Jesus has sent the Holy Spirit to help us live our lives according to His will. One of the blessed things that the Holy Spirit gives us peace not only with God but within ourselves no matter what is happening around us. Thank you Lord for not only coming to save us from sin and death but for sending us the Helper to help us live in this sinful world until you come back for us. Merry Christmas, Peace on Earth and Good Will to Men! 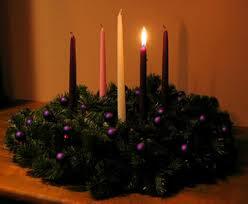 Today we light the four candles on the Advent wreath. Christmas is fast approaching. In the hustle and bustle of getting ready for that special day this should be the week where we think about what love is for it came down to us in Christmas. Jesus came not to give us presents but to give us the opportunity to live in God’s presence. What great love God has for us that He would give His only son to die for our sins. John suggests that since we are now children of God we should begin to act like God does. We do this by acting like Jesus did when he was here in the world. Jesus reached out in love to all who were in need. My granddaughter’s class spent a day last week going to the police station where they gave them a plate of cookies, then on to the nursing home where they sang Christmas songs and left small bags of coins at each coin machine, then onto the animal shelter where they gave out special treats. These were their random acts of kindness. What act of love can you do this week that will make a difference in the life of someone else who is less fortunate than you or someone who like a policeman or fireman or military family whose acts of service are not always shown the appreciation that they deserve? 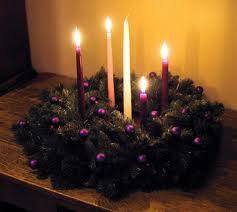 On the third week of Advent we light the pink candle along with the two previously lighted purple candles. 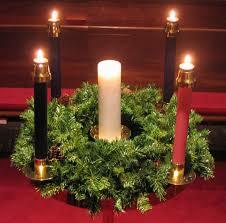 This candle has sometimes been known as the joy candle or the Mary candle. What great joy we experience at the birth of a new baby. It doesn’t matter if it is our child or another’s. We rejoice. I imagine both Mary and Joseph were full of joy and marveled over this new little one. Add to the normal parental response of a new baby the wonder at knowing that this child was to become the long awaited for Savior of the world and the immense wonder at being responsible for His well being until He was able to take over that role. In this scripture we also see the angels’ joy at announcing this birth to the shepherds. After the shepherds got over their fear and understood the angels’ announcement, they were filled with joy at the prospect of seeing the fulfillment of the prophecies of old with their very eyes. When they reached the manger scene their joy was so overflowing that they just had to spread the news, which reminds me of my son’s favorite song, “Go Tell It On the Mountain,” for this is what they did. This is the week to think on the joy of knowing our Lord and the joy of this life God has given us. It is the week to be filled with gratitude for all of the people in our lives that we so dearly love and often forget to tell them. Take some time out this week to ponder the joys of your life. “…Mary treasured up all these things and pondered them in her heart. The shepherds returned, glorifying and praising God for all the things they had heard and seen, which were just as they had been told.” (Luke 2:19-20) Take a moment to thank God for all He has done and all He means to you. Take joy in God’s provision for your salvation (Jesus). Week 1 is all about preparation, some say expectation, some say prophecy, but it’s focus is about getting ready for the Christ Child’s appearance. Often this week focuses on the prophets of old foretelling of the Messiah’s birth. Luke 3:4-6 tells of John the Baptist speaking the words of Isaiah telling the people to “prepare the way for the Lord.” This is a time to prepare for Christmas, the coming of the Christ Child, a renewal of our gratitude for Jesus being willing to give up heaven and to come to us in human form and endure all of this world so that we could be saved and live eternally with Him in glory. 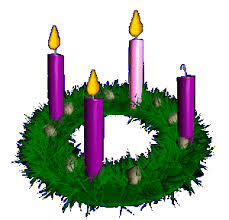 This is a time to remember that it is not presents, Santa Claus, desserts, parties, family, or friends that make this season bright; it is the gift of God’s own Son to us, Emmanuel, God with us, that lights up the night. Let us prepare our hearts to receive more of Him as these weeks proceed.